I am sure you already know the embassy from the picture. Yep! i went to the almighty US embassy to try and get a visa. Maybe I shouldn’t call the trip disastrous and say it was a money wasting, time wasting, casual leave wasting trip. Nope! It should be called anger spurring trip to the US embassy, Abuja. I just remembered the nonsense one of the ladies did to me and I am mad, really mad. But I think I should start from the very beginning so that you guys can understand why I am mad (or technically why I was mad). So I decided that since I enjoyed my trip to SA last year that I should make another trip to another country this year. So while I was checking out countries, my friends in US asked that I come and visit them. I had heard a lot about the American embassy being very annoying and that they thrived in embarrassing people so I had never wanted to go there. Besides there was nothing for me there. So it took quite some persuading from different friends to make me consider it. A lot of things were just not going according to plan and I was tempted to stop all attempts but I decided to just go ahead just so that they are not disappointed. So I used my last 3 days of causal leave and left on Tuesday to Abuja. On Wednesday, when we got to the place some boys made me realise that I didn’t have a document. You should see the way I was stressed and annoyed that I had not done everything right. My father and I went to his office and after a lot of searching I got something that looked like the document. Off we went to the gate, I was over 30 minutes late. I went there and the guy said I didn’t have the document but since my name was on the list he allowed me to enter. I got there and I was number 534. I was just laughing at myself. A lot of people came in their uniforms and with their i.ds on them. I noticed a lot of families and I also noticed that families were given visas and those with family members living in the US were also given. So i had begin to see the pattern already. When it was my turn the lady asked me about 5 questions and said I don’t meet the criteria to be allowed to enter their country. I am not mad about the refusal but mad about the way she did it. I noticed that the other ladies when they refused people, they still pretended to be interested. As for my lady she didn’t even look at anything I brought. Apparently maybe she thought I was lying about my job or she felt that once I get to US I would run away. For Goodness sake, why would i leave all that i have all that i have here to go and suffer there. It amazed me that she thought so but my dad explained that she has probably seen a lot of people perform stunts like that. Why else am I angry? I wasted over 40k on the whole fiasco and I am mad. Do you guys know how many shoes or clothes I could have gotten from that money? I just saw a message about an easter sale where 4 dresses would go for 20000 naira at the Oja Ara event and the anger came back again. But I have decided that it ain't worth it to be angry anymore, she had the right to do what she did. She has trying to keep her country safe but I would like that she does it with more finesse. However you guys should have seen how my friends and aunty were vibrating and hissing at all the nonsense that happened. My friends in the US felt bad but I had to let them know that they shouldn’t. People also thought I was rejected because of small size (as i look younger than my age), however whatever their reason is it is their problem. The most encouraging reaction was from an American, he was so angry. I had to let him know that the lady had the right to do what she did even though she did it for the wrong reason and to the wrong person. He still called it ‘illegal’ and I was like (in my mind) ‘shey you know na your people’. He is such a sweetie, angry over my supposed 'illegal rejection'. 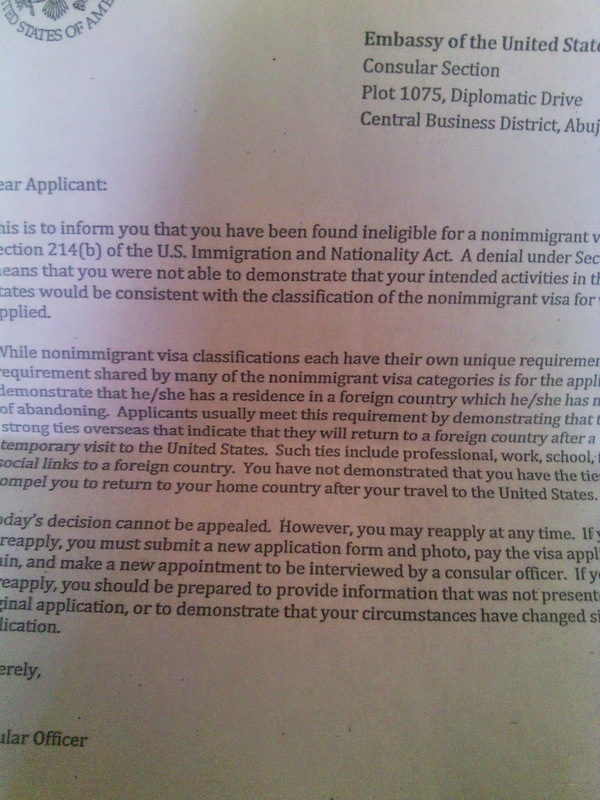 Oh well that was my sojourn into the world of US visa application and denial. A friend suggested that i reapply and i said never! There is nothing for me there and i hope that i would not have anything that would desperately require me going there. Unless someone else pays for the fee and brings the visa to my doorstep, i ain't bothering myself. So what am I going to do now? What do you think? Sulk and continue to be angry or look for another country and jet out for some serious R and R? Knowing who i am, take a wild guess guys. Thanks to all my peeps that got angry on my behalf, you guys are amazing. I also want to say a big thank you to those who have missed my write ups. Thanks for always checking my page. Happy Easter in Advance. I wish you all the blessings of this season. Yay! She is back. Thanks dear, i think i should go to morocco. Heard it is quite lovely. I hope their visa wahala is not too much o. Let me google it. Please accept my instagram request na, i don't know what i went to do before.